I macerated a mix of sliced, home-picked and leftover bought strawberries in 3 teaspoons of caster sugar, 1 teaspoon of aged balsamic vinger (a birthday present) and a good grinding of black pepper. 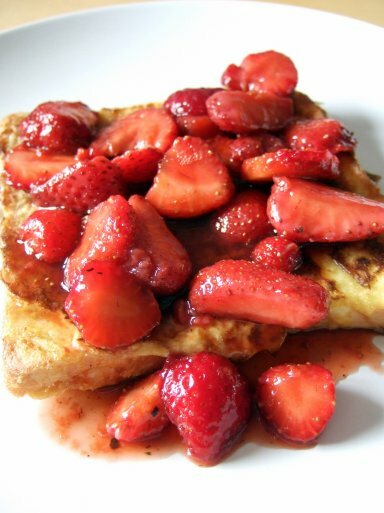 What a brilliant idea to serve on french toast, Shereen. I would never have thought of mixing in balsamic. I guess it would have to be a really good one, as yours obviously is. Might try that tomorrow in place of our usual fry-up weekend brunch. It is just too hot for that type of cooking. I have to 'fess up and say the vinegar tip came from HFW. He used aged cider vinegar which I don't have, so I substituted some of the amazing balsamic the lovely JennyB brought me from Paris. We had a wee bit of French toast with thin chorizo slices on it for the savoury part of brunch - nice, but the thin ham is nicer. When you say macerated do you mean sliced or pulverised? Sliced, mostly. But one or two ended up pulverised as I mixed enthusiastically a couple of times. Absolutely agree, Joanna - I thought to macerate meant that something is reduced to (very) small pieces. What is the difference, then, between that and to marinade - after all, isn't it meant to do the same thing? I believe (but might be wrong as Domestic Science lessons were a longlong time ago) that you macerate fruit to draw the juice out and make syrup; whereas everything else is marinaded to tenderise and get flavour into it. Thats how I understand it. The more people I meet, the more I love my animals! I have a question - how do you define French Toast? Slice of bread soaked in egg and milk and then fried. Thank you! I've never made that. When I was little my Mum would toast bread (at the fire) that had already been buttered and called that French Toast. You see how little I know?